Peace-loving boarders from down under. My luck with hosting parties during my B.Y. High years was not good. Many of my friends did have great parties at their homes or around the city, in contrast to my continued misfortune with social gatherings. One problem was that our Taylor family home was located in an "uncivilized" area well outside the then-city limits of Provo. In our neighborhood there were only two or three houses within a two-mile radius. My bad luck began when I was 8 years old in 1939. My parents made a rare effort to help me gather up my school friends from Provo and bring them to our home for a birthday party. All went quite well until our games and other activities became quite lively. 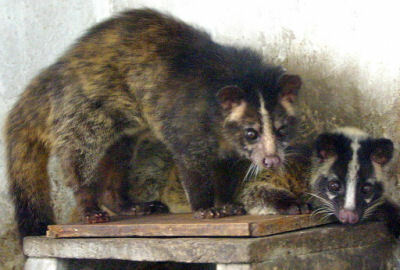 The noise and floor stomping excited a family of civet cats -- skunks without body stripes -- that up until that time been peacefully living under our house. The unusual commotion in our house caused them to do what they do best, in their home beneath our floorboards. Soon the house filled with an odor so strong that everyone's eyes began to water, and all my birthday guests began to panic and scream. The party ended abruptly and my parents implemented our shuttle back to Provo earlier than had been anticipated. I tried to host several other parties at home over the years, but the collective success of my social gatherings did not improve substantially. So when I was a junior at B. Y. High in 1948, I decided to invite my friends to join me for an early Spring picnic, rather than a house party. The response was good, so I put my plan into action. Most of us could drive, and a few family cars were sometimes available, if parents’ arms were twisted. 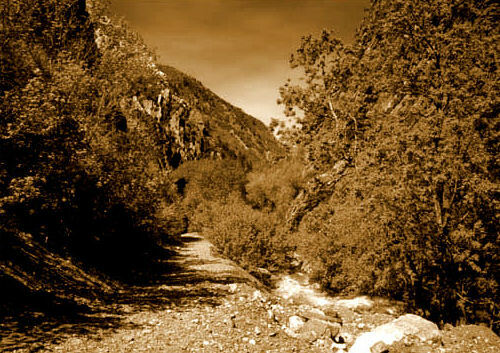 On the appointed day, several cars followed mine to the mouth of Rock Canyon, which was near my home. This was still a fairly primitive area in those days. Ninth East was mostly a gravel road, and the Rock Canyon road was a Jeep trail at best. Our hardy band arrived for the party in one piece -- with only one reckless driving ticket on the way. The group included Jack Zenger, Armond Hawley, Marion and Marilyn Norton, and probably Gene Tuttle, Karl Snow, Ken Collard, Mary Young, Paul Clark and several others. Hank and poison ivy sticks in 1948. Some of the members of the group cut their roasting sticks from a little nearby thicket. Though there was still some snow on the ground and no leaves on any bushes or trees, the thicket looked to me like it could be trouble and I warned them that it might be better to look elsewhere for roasting sticks. But, of course, everyone found their sticks wherever they pleased. Then as the sun began to set we roasted marshmallows, sang songs and told stories. It was a grand evening -- the best party I had ever hosted. But in the days following, Marion and Armond failed to show up at school. Soon I learned that Marion had gone to the hospital with terrible, painful, itching skin eruptions. Armond was confined to bed at home with big weeping blisters all over his body. A few others who had attended my picnic had somewhat less dramatic ailments, but the ill effects lasted for weeks. The leafless thicket had indeed been poison ivy, as I had suspected. Several of my friends had said, “Oh no, we know what poison ivy looks like” and had gone ahead cutting the nearby vines. Attending parties in the wilds of the Rock Canyon and the adjacent hills held some obvious dangers, for example, with snakes and falling rocks. But the threat of poison ivy-seasoned hot dogs and marshmallows was now added to everyone's list of things to beware of when partying or hiking in this untamed area. And my growing reputation as a party-giver had suffered another relapse. Despite the problems he experienced in organizing social gatherings, Henry "Hank" Dixon Taylor, Jr., was elected President of his BYH Senior Class for 1948-1949. Born in Provo, Utah in 1931 to Elder Henry Dixon Taylor, Sr. [BYH Class of 1921], and Alta Hansen Taylor, Hank was one of their four children, all sons. After graduation from B.Y. High in 1949, Hank Taylor married Colette Green. The Taylors have raised nine children -- so far. Hank pursued degrees in Business Management and English from BYU, followed by a Masters degree in Business Administration from Harvard Business School. He served as Director of Telecommunications for Hewlett-Packard until his retirement. He has served in almost every Church position, including several times in stake presidencies, and as a misson president. Hank Taylor looks back on his days at B.Y. High with great fondness, and has written several stories to share with other BYH alumni and friends.